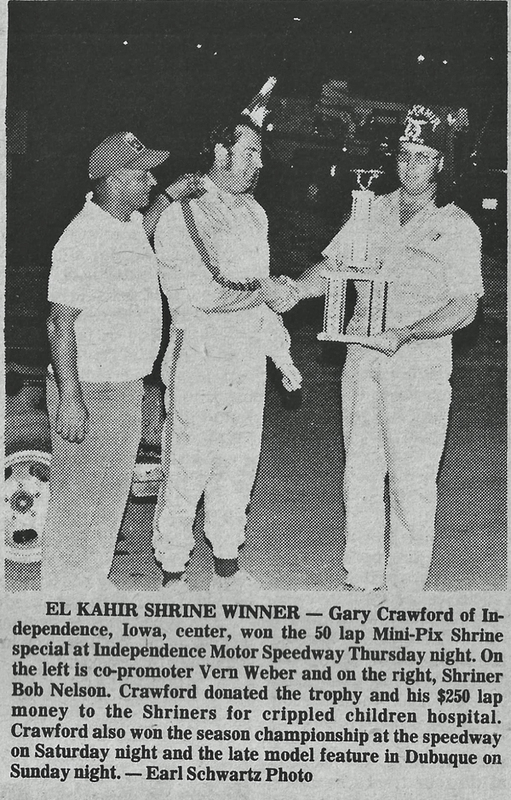 Independence, Iowa (August 31, 1978) – Gary Crawford of Independence, Iowa, rode a first-lap maneuver to a 50-lap late model victory in the first annual Mini-Pix Shrine special at the Buchanan County Fairgrounds on Thursday night. Crawford started on the second row but roared past front row starters Curt Hansen of Dike, Iowa, and Glen Martin of Independence, Iowa, to take the lead. He would hold the top spot for all 50 laps, picking up a very popular victory in front of the hometown fans. Obviously, making money wasn’t Crawford’s only concern. He earned a total of $1,250 in feature winnings. But he donated the $250 he earned in lap money back to the Shriner’s hospital fund, which the beneficiary of the evening’s races. Crawford also returned the winner’s trophy which will be put in display at the children’s hospital in Minneapolis. Crawford’s pre-race analysis proved correct. In fact, it almost cost him the race. Crawford’s car went too high on lap 33, and Glen Martin tried to get underneath Crawford but was blocked out by a slower car. Hansen, who earned the pole position by winning the first heat, finished second to Crawford, passing Martin on lap 48. Denny Osborn of Cedar Falls, Iowa, also got around Martin on the last lap to place third. Thursday’s late model turnout was one of the most impressive fields in the state this season. Waterloo, Iowa’s Ed Sanger failed to place in the top-five in his heat and didn’t qualify for the feature. 7. Leon Plank, Mondovi, Wis.
St. Paul, Minn. (August 29, 2016) – Don Mack, known as the “Flying Dirt Farmer” from East Grand Forks. Minn., picked up his biggest racing paycheck of his 17 years in competition as he won the 200-lap Minnesota State Fair sprint car championship feature race on Sunday afternoon. 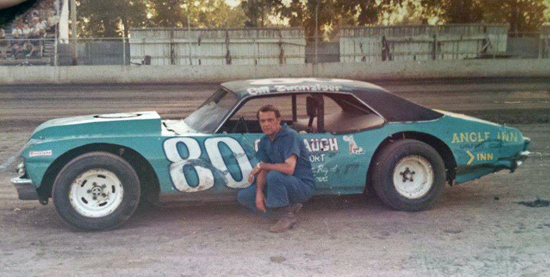 He collected $4,500 for his win which was witnessed by 6,256 race fans. 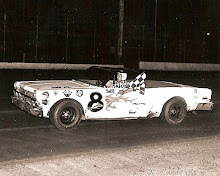 Mack emerged victorious although Casey Jones of South Bend, Ind., and Marvin Carman of Union City, Mich., dominated the 100-mile event at the half-mile speedway. It was not until after the race had finished and the lap charts double-checked that Mack was finally declared the winner. 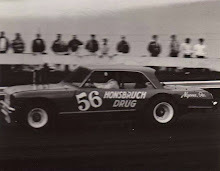 Mack piloted a car owned by Doug Howells of Hunter, N.D.
Jones appeared headed for the victory until he was forced to make a second fuel stop on lap 189. Darl Harrison of Tiffin, Ohio, took runner-up honors, 25 seconds behind Mack. Mack, who made a pit stop midway thru the race, said he was sure he won the race when he was interviewed by the public-address announcer before the order of finish was determined. Jones, who started in the second row, led for the first two laps before yielding to Bobby Baker of Salt Lake City, who led until lap 23. Marvin Carman would take over until his first pit stop on lap 127. He would blow his engine five laps later. Jones would inherit the top spot on lap 128 and lead until his pit stop on lap 188. Mack would take over from there. It was Mack’s first win at the historic oval since he had won two super-modified races there years ago. Ron Larson of White Bear Lake, Minn., won the 20-lap consolation with Bill Dollansky of Elk River, Minn., finishing second. 1. Don Mack, East Grand Forks, Minn.
3. Galen Short, West Unity, Colo.
5. Casey Jones, South Bend, Ind. 7. Mike Schiesel, Oak Creek, Wis.
9. Bill Dollansky, Elk River, Minn.
10. Lynn McIntosh, Thunder Bay, Ont. 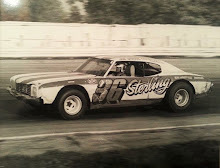 Du Quoin, Ill. (August 26, 1978) – When Don White stormed into the lead on lap 47 of the 100-mile United States Auto Club late model stock car race Saturday afternoon at the Du Quoin State Fairgrounds, he felt confident. “I knew it was over after I took the lead,” White said. The Keokuk, Iowa, native went on to win the $22,538 event and the top prize of $2,815 – but not without controversy. Bay Darnell, who finished second, had passed White on the final circuit of the 100-lap event to become the apparent winner. However, USAC official Billy Saxon ruled that Darnell overtook White while the yellow flag was still out, which is illegal. 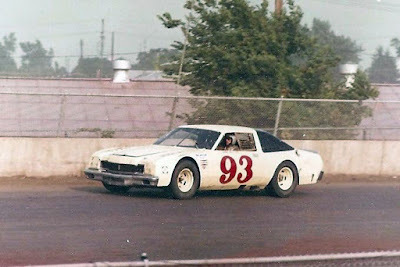 The yellow flag was signaled on the 97th lap when Gary Bowsher lost control of his car and bumped the rail on the curve near the front straightaway. 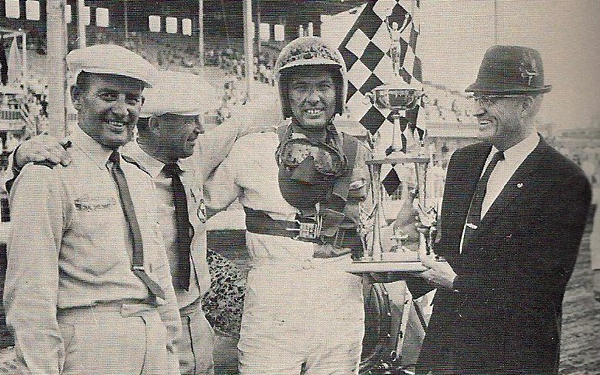 White was declared the official winner of the race, much to the chagrin of Darnell, who angrily talked to Saxon and other USAC officials later in an effort to get the decision reversed. Darnell even considered lodging a protest but decided against it. He contended that he passed White on a green flag, which is legal. The real winner, White, was a bit more cheerful as he agreed with USAC’s decision. But he said he couldn’t blame Darnell for his bitterness. “He wouldn’t be much of a racer, if he didn’t feel that way,” White said. White said the problem could have been adverted if another driver, Rich Sundling, who was not in the running for first place, had not cut between the leader White and the pace car. Sundling inadvertently drove in between White and the pace car, which White said almost cost him at a race last weekend in Springfield, Ill. White claims he lost that race because Sundling hit him from behind. “They shouldn’t have yellow flags in the last 10 laps of the race unless something really serious happens,” explained White. White, driving a Dodge Aspen, was 19th in the USAC point standings but added 250 with Saturday’s win. But White was interested in winning. “That’s what I came for,” said White, who also won the USAC event at Du Quoin in 1968. Terry Ryan of Davenport, Iowa, who placed third on Saturday, gained 180 points and now has 1,550. A.J. 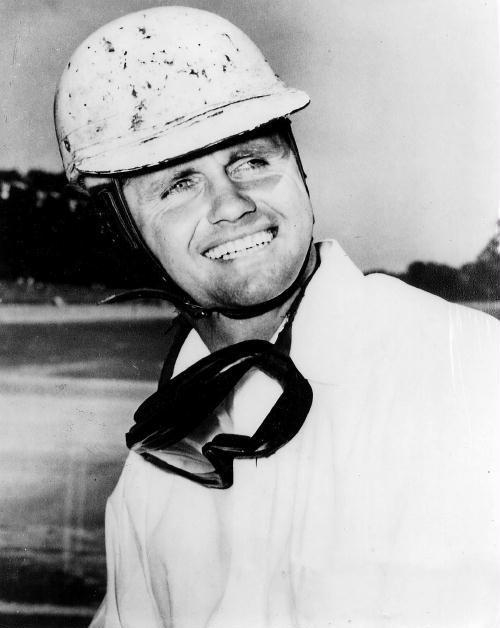 Foyt is the current leader with 1,615. Foyt did not race at Du Quoin. 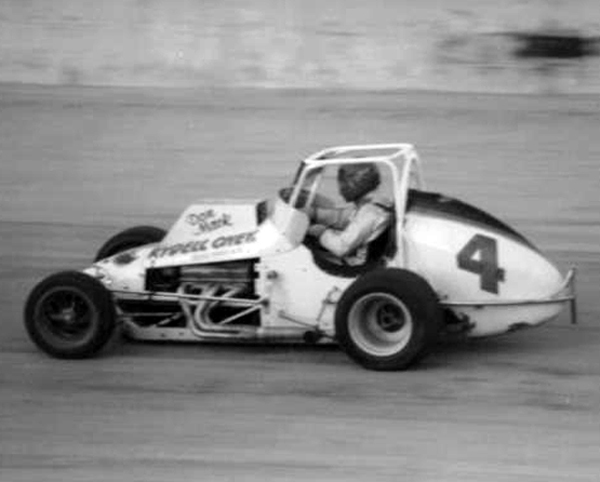 Paul Feldner, the defending Du Quoin winner and 1977 USAC national champion was a spectator at the race because of a dispute with car owner Gary Wulke. The argument started two weeks ago prior to the Milwaukee race over a new engine. Feldner stated he was finished for the remainder of the season and was contemplating retirement. Sedalia, Mo. 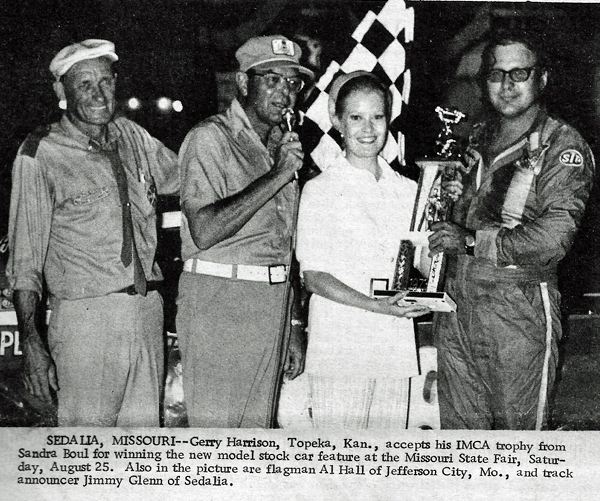 (August 25, 1973) – Gerry Harrison of Topeka, Kan., got sweet revenge and $350 for his win Saturday night in the IMCA new model stock car race at the Missouri State Fairgrounds. The new models moved from the mile to the half-mile for the evening program, running three 10-lap heats and the 25-lap feature. Harrison brought his 1972 Chevrolet home a half-lap ahead of Mike Derr of Keokuk, Iowa, the winner of the 101-mile Missouri International in the afternoon. Harrison led all the way for the win, a repeat of his 1972 finish in the same race. He and Derr, along with IMCA point leader Gordy Blankenship of Keokuk, Iowa, qualified for the 25-lapper through the 10-lap consolation. Derr won that event with Harrison second and Blankenship third. Heat winners were Ray Blohm of Arlington, Tex., Shorty Acker of Windsor, Mo., and Mike Wallis of Gardner, Kan.
1. Gerry Harrison, Topeka, Kan.
3. A.C Saint, Tulsa, Okla.
5. Steve Lutkie, Wichita, Kan.
7. Larry Lynch, Dallas, Tex. 8. Jim Hagar, Liberty, Mo. 9. Gary Brooks, Grand Prairie, Tex. 10. 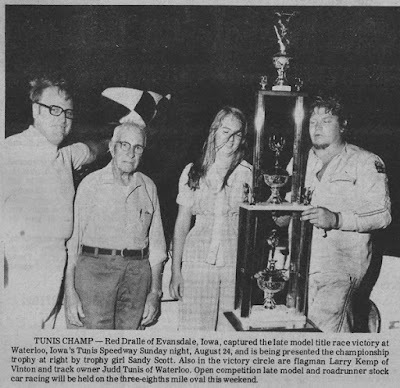 Mike Wallis, Gardner, Kan.
Waterloo, Iowa (August 24, 1975) – Red Dralle of Evansdale, Iowa, came on with a heavy foot Sunday night to win the 50-lap late model season championship feature. 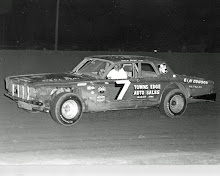 Dralle started dead last in the 15-car field but finished first in a race that saw the favorite, point leader D. Arthur Nesteby of Waterloo, Iowa, make an early exit on lap 8. Nesteby, who won three 25-lap features and the mid-season championship at Tunis this season, came into the third turn with his gas pedal sticking to the floor and he couldn’t make the turn. He went off the banking, overturned once, and came to a stop on his side. Nesteby was not injured, but his car suffered significant damage to the front end. Bob Hilmer of Dysart, Iowa, would take the lead when the feature’s green flag waved and led most of the way until gears went out of his quick-change and he was forced out after 27 circuits. Dralle, who had steadily worked his way through the field, took over the top spot on lap 28 and led the rest of the way. Denny Osborn of Cedar Falls, Iowa, made several challenges to Dralle but couldn’t overtake the redheaded speedster. Karl Sanger of Waterloo, Iowa, another favorite who was second in points to Nesteby, finished a strong third. Tunis promoter Claus Stricker pushed the 50-lap feature up on the program when ominous dark clouds started moving early in the program. The high winds and rain washed out the 15-lap consolation. Cedar Rapids, Iowa (August 23, 1953) - Eastern Iowa fans will get a chance to see big time Triple A racing in 1954, but it won't be under the direction of race promoter Sam Nunis. That was the announcement by All-Iowa fair officials Monday as the aftermath of a rhubarb Sunday afternoon that marred, an otherwise outstanding speed program that wound up the four racing events at the record-breaking 1953 fair. 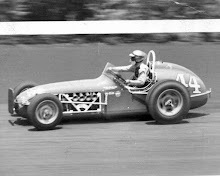 Minutes after Bob Sweikert rolled to victory in the 25-lap feature event, Nunis instructed race announcer Chris Economaki to the fans that, because of poor support, Triple A would not be returning to Cedar Rapids in 1954. Nunis complained that 6,500 fans were not enough to support Sunday's field, which included 14 Indianapolis 500 drivers and a record-breaking 16 Offenhausers among 21 cars, which timed. Fair officials, AAA officials and the drivers themselves disgruntled with the PA announcement, gave quick assurances to the crowd that Nunis was speaking only for himself and not for the Association, the number one racing group in the nation. Such outstanding drivers as Johnny Parsons, Duane Carter and Tommy Hinnershitz – three of the top stars - gave assurances to fair officials that they were ready to return in ‘54, with or without a promoter. “We don't want to give the fans the wrong impression about AAA,” one driver explained. Fair officials later pointed out the 6,500 fans in attendance were only 1,500 below the average of 8,000 which Nunis-promoted shows had been drawing, and his races have been previously been staged in many larger towns, including Detroit. One official pointed out that Nunis had received his guarantee of $5,500 which was what, his “own contract called for”. A report on Nunis' conduct has been forwarded to Triple A offices in Washington, D.C. Otherwise, Sunday's program was outstanding, despite a poor track that was built up under Nunis' direction. In the time trials, seven cars timed well under 25 seconds and eight more were in the 25-second bracket. Even in the final 25-lap event, with the track slowing noticeably under the effects of the week's hottest afternoon sun, Sweikert averaged 27.4 seconds a lap. Sweikert, an up-and-coming young star, from Los Angeles, started outside in the front row, but fell off the pace in the early laps. He had to pass Jerry Hoyt a third of the way along for the victory. Jimmy Bryan, moving up fast, wound up in third place. The top race of the day was a three-car dash, with a special $150 purse going to veteran Duane Carter in a photo finish with Fats O'Conner. The field narrowly escaped an accident in the third heat when Don Freeland spun his Offy out on the second lap. After one lap under the caution flag, the race continued and wound up with Johnny Thomson in front in the creditable time of 3 minutes and 33 seconds. 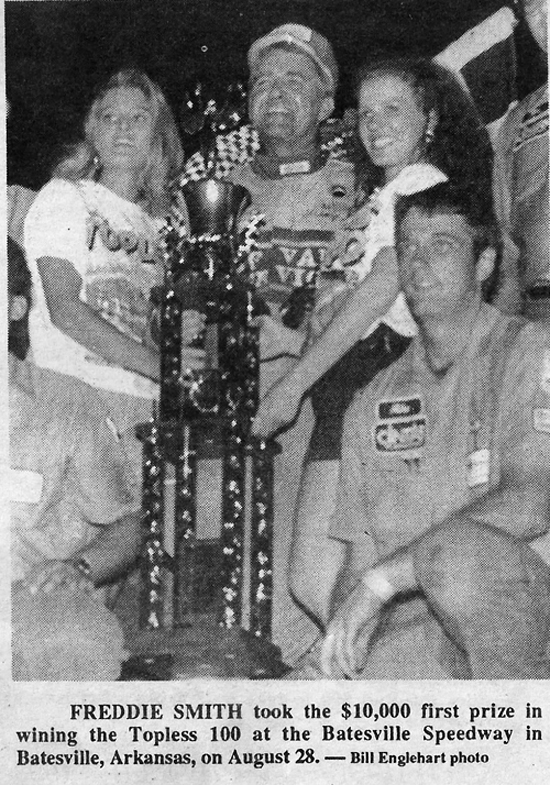 Tommy Hinnershitz, one of the all-time veterans of dirt track racing and now in the process of winning his fourth straight AAA dirt track crown, had a rough day. Starting eighth in the feature, he and one other driver, signaled for a restart in the windup, but the signal was ignored. Hinnershitz was dead last going into the backstretch and more trouble forced him out a lap later. 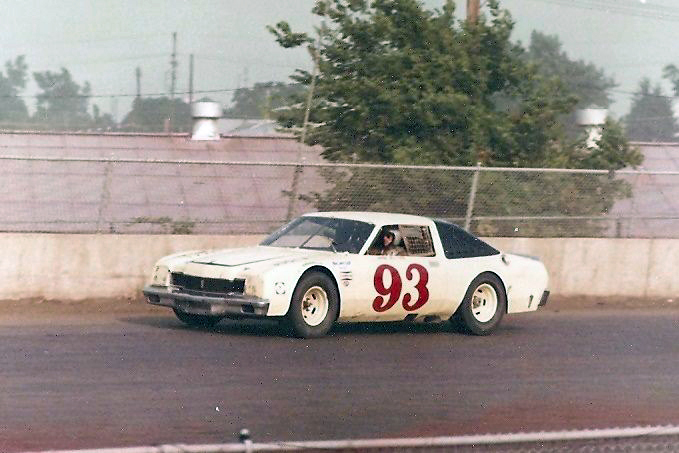 Jimmy Daywalt, another young "500" star, had his troubles with his Agajanian #98 in which Troy Ruttman was seriously injured at the Downs' track a year ago. He failed to place in his heat race, and then lost out to veteran Duane Carter in the consolation. As a result, he didn't qualify for the feature. 1. Bob Sweikert, Los Angeles, Calif.
2. Jimmy Bryan, Phoenix, Ariz.
3. Jerry Hoyt, Indianapolis, Ind. 4. Duane Carter, Indianapolis, Ind. 5. Larry Crockett, Columbus, Ind. 6. Johnnie Parsons, Van Nuys, Calif.
7. Bob Scott, Gardenia, Calif.
8. Ed Elisian, Los Angeles, Calif.
9. Johnny Thomson, Springfield, Mass. 10. Tommy Hinnershitz, Reading, Penn.